How to design a fuel meter using Circular Gauge? This article explains you to design a fuel meter using Circular Gauge. In fuel meter, the variations in fuel level can be identified by differentiating the Scale of Circular Gauge using Range in Circular Gauge. Fuel levels can be split up using range of different colors. Add Major ticks and Minor ticks, which can be used to indicate the total number of fuel readings. In order to identify the exact level of fuel available, Range Pointer in Circular Gauge can be used as follows. Headers in Circular Gauge can be used to render Text in Fuel Meter. Since positioning is possible with Header, different Texts can be positioned in the needed position. 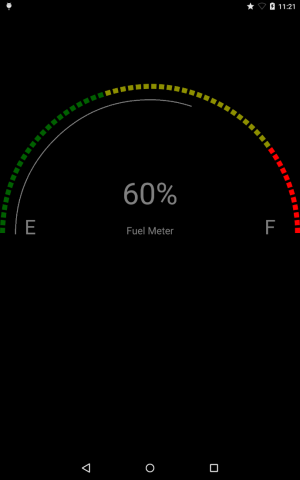 The following screenshot displays the Fuel Meter using CircularGauge.